3.8 out of 5 based on 95 bloggers and 13 commenters. Magasin Cuatro is a free blogger template adapted from WordPress with 3 columns, magazine-styled, right sidebar, web 2.0 design, fresh look and neutral colors. This template is really unique for bloggers. First the three distinct columns and a narrow post area adds to attraction. Moreover this template is good for displaying adsense ads which however you cannot notice in the live demo from btempltes. you can view the original author’s demo to see the actual features. I mean for the adsense spots and ya also the Flickr gallery random pics widget in this template also adds to attraction. Couldn’t figure out how to add more stuff below the Flickr box. Well, I could, but I couldn’t manage to get the header to show up properly, or get a gap between the photo section and the next object. If elements could be added, I would’ve used this, but … it gave me a headache. I’m not HTML genius. 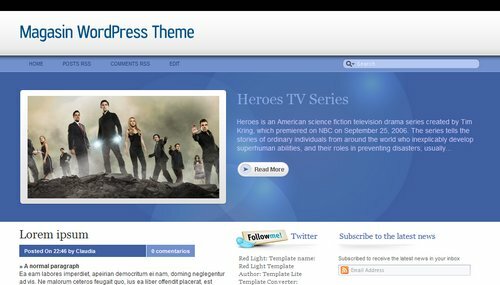 This theme is really useful for Blogging. The Three column feature looks attractive. The narrow post in the home page very interesting. mantab . . , thank’s . Nih website emang bener nyediain yang gw cari . .
Hi can I change the color of the template to red?